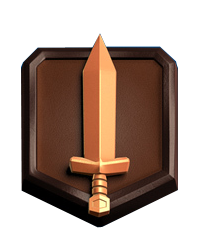 Getting to "Challenger I" as a 10 lvl player | Clash Royale fan-site! Home » BLOG » Getting to “Challenger I” as a 10 lvl player is quite possible (deck, tactic tips, etc.)! Miner. A card for attacking the opponent’s Towers, as well as eliminating the Elixir Collector, if opponent has installed it in the arena. Also, with the help of Miner we can block opponent’s Inferno Tower and cover Mega Knight in attack (how to do it I’ll write in separate post). Mega Knight. A very powerful card, with the help of which we can quickly stop opponent’s attack and begin our own one (due to his spawn damage ability)! 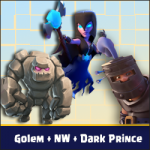 In other words, Mega Knight is an excellent answer to lovers to play with Elite Barbarians, Three Musketeers and Hog Rider! Goblin Gang and Bats. Two cards that showed themselves very good both in defense and in attack! 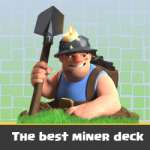 Miner and every one of these two cards make a very good counter-attacking combination! Mega Minion. Very effective card! Due to high hitpoints level and decent damage power, shows itself very well in defense as an eliminating tool for Balloon, Baby Dragon, Inferno Dragon, etc… Do not change this card for another one. Goblin Hut. The only building type card in the deck. Spear Goblins are very good support for Mega Knight in attack. Also this card is a very good opponent’s irritant, because cannot be ignored. Don’t launch Skeleton Barrel alone without any support! In such case the barrel is almost useless. 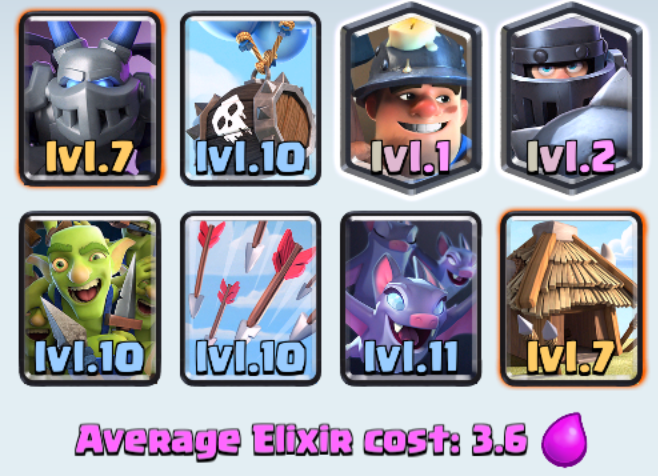 Skeleton Barrel is such card which perfectly shows itself in tandem with other cards (for example Mega Knight, Miner, etc. 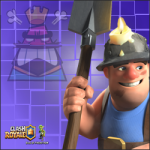 ).But in case of Miner, we need to take into account different speed of move of two cards (good time for Miner deploying is when the Skeleton Barrel is near the target) . 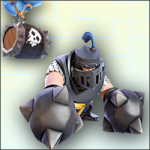 If you like to start the battle and attack first, I advise you not to start own attack with Mega Knight deploying… Hold it for more effective and effective appearing onto arena, namely the reflection of enemy attack by dropping it onto the heads of the opponent’s attacking units … This will simultaneously repulse the attack and create a basis for own counter attack. Try to not deploy Mega Minion and Bats simultaneously onto arena until you know opponent’s deck. In such case you risk to miss counter-attack with Balloon, since you will not have cards that can stop it. That’s all! Try this deck and tips and I’m sure you will also get to “Challenger I”! Tagged Arena 12, Decks, Goblin Hut, Mega Knight, Miner, Skeleton Barrel. « Arena 11: Excellent deck with Mega Knight, Skeleton Barrel and Miner!